Well then, it’s decided. The first flight and the first hotel are booked. It’s also clear that we can’t afford an agency to do all our bookings so it’s a plea for help. We are very lucky that my daughter-in-law studied Japanese, is based in Hong Kong and has lots of friends who are knowledgeable about Japan. 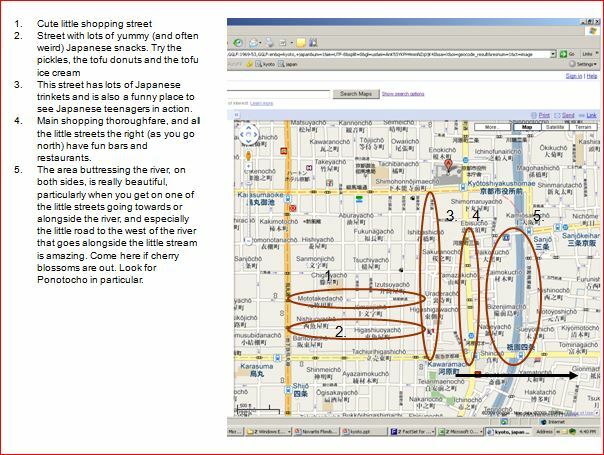 She very kindly emailed them our outline schedule and to my amazement – these are high powered businesswomen – we had wonderfully detailed and informative responses including, and I quote, “my dorky walking map of Kyoto” which is quite the most useful thing I have ever been sent. Real insider knowledge set out clearly on a series of maps we can follow when we get there. So it was onto the tablet straight away with those. It also helped us to resolve a travel issue that was proving very perplexing. Hiroshima is an important place to visit for anyone with an interest in history – my wife, or anyone with an excessive sense of guilt – me. But it’s a very long way to travel and if we do include Hiroshima we have to drop some other Murakami or garden locations. Do we not go from Kyoto to Nara for the day? Do we miss out on the wonderful sounding Naoshima Art Island which we’d seen in a leaflet from JNTO and was highly recommended by one of our experts above. On balance and with a memory of a glazed look from an admittedly very young lady in the tourist office when asked whether she would make the long journey – it’s a no for Hiroshima. I know there will be a little regret at not standing in the peace garden to reflect – especially with Garden of the Evening Mists’ Japanese war in Malaya setting fresh in our memories – but apart from the peace park the Japan Guide lists the next three attractions as a garden (not one of Japan’s top three), a concrete reconstruction of the nuked castle and downtown. On balance it looks like the right decision. “Takayama is considered one of Japan’s best festivals”. The citizens of Takayama are greedy in that they have another festival in October but given the proximity to the Northern Japan Alps maybe spring is the better option. Never in my life have I clicked on booking site hotel flags with increasing lack of concern to their proximity to the centre of town to find every single one with the legend “SOLD OUT”. Ooops! Ooops! Ooops! Spread the net to 20 miles from Takayama and a room is available. I’m usually sceptical of the exhortation “only one left book now” but in this instance my click is very firm. Who knows what the Pension Green Lake will be like? It’s not far from the festival, it has a bed, it’ll accept my booking. Tripadvisor had two high starred good reviews – but in Japanese and Google translate didn’t help much. However it’s only an hour from Shirakawa Mura the UNESCO World Heritage Site with its steep sloped, thatched-roofed houses which we want to visit anyway and we can get to Takayama. We’re there for two nights – it had better do.